This is a topic that really caught me interested when it came out, as it's been an old battle of mine. I used to work in tech sales. I sold computers and cameras and TVs and whatnot. And, while most times a spec jump that's higher than the previous means good things, there's one area that it's not necessarily true. For me, it's MegaPixels. Higher didn't always mean better. 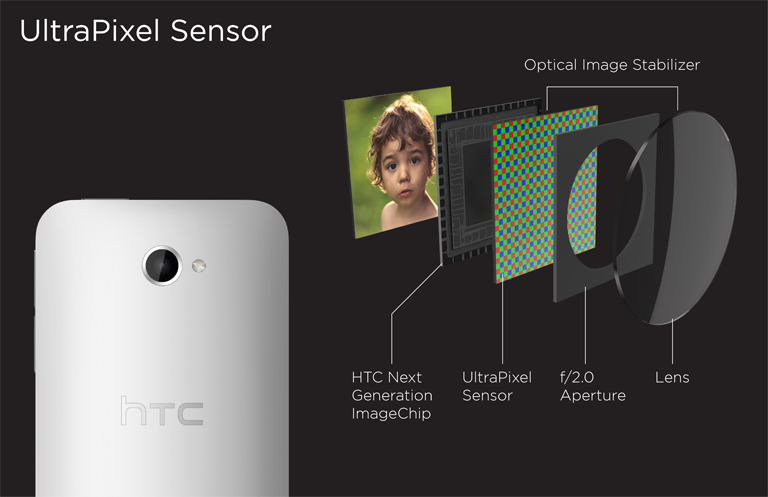 So what does HTC intend to do with these Ultra Pixels listed in their phone? It's going to be a bit of a struggle to educate folks on this, but there's solid theory behind it. 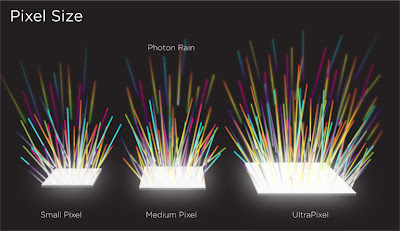 In the beginning of digital cameras you'd try to get as many dots on the sensor as possible. The problem was that for many cameras the sensor size stayed the same. Think of the old film slide. That 35mm film was the same shape and size for years. Compare it to medium format and 35mm was hard to compete. Chemically speaking there was the same number of 'dots per inch' for each, but because we had MORE in medium format it could make better pictures. If you tried to compress medium format into a 35mm frame size it wouldn't do you much good. The pixels (i.e. the chlorides) would be so close together that it'd be hard discern one and the one next to it. It would be a bit of overkill and some of the definition would be lost. Same goes for digital realm. Cram more pixels onto the same size frame sensor and the pixels get too close. Add to that they'd have to get smaller to fit more and we enter a new issue. The smaller each pixel is the more light it would need. More light would mean potentially longer shutters, so blurrier... potentially. Also, the less light getting to each pixel would mean you'd need a stronger amplifier chip to ENHANCE what light it got. This would introduce some signal-to-noise ratio, and that's where we get 'noisy' photos. HTC is touting 4UP for their camera. That means that every pixel that is there is getting more light than a similarly sized sensor with a higher MP count (if say it was 8MP, rough math might show that it's each pixel is getting 2x the light - signal). Sure there are less pixels to blow up and make a huge picture to hang on your wall... but if they're better pixels, you'll be happier with what you have. Plus, it'll work better in lower light conditions - something that's the bane of many smartphone cameras out there. Besides seeing more light, you can also tell (if you enlarge) that the others have more 'grain', more noise in the photos. Blow those photos over 8x10 and you'll really see the damage. It's an interesting play... truly it's a marketing ploy to get you to understand that bigger numbers don't always mean better, but better numbers do.